"The bells of St Thomas and of St Mary were much in evidence. By kind permission of the Admiral Superintendent of the Royal Dockyard, the ringers were allowed to leave work to ring the bells, and sufficient ringers were mustered to man both peals of bells. 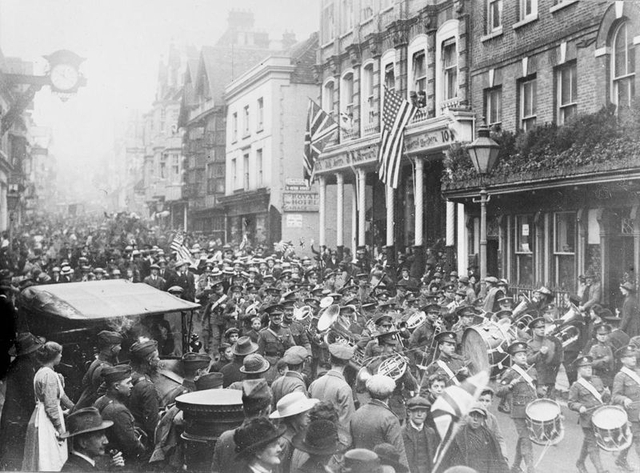 At 12 noon, simultaneously with a service in front of the town hall, and with hooters blowing, both peals 'fired' and continued to ring at intervals. At 3pm the bands changed over. In the evening, at both churches, further, ringing took place including visiting ringers from Gosport." During the nation's WW1 Centenary Commemoration period, ringers have been pleased to work alongside churches and communities to honour and remember those who made the supreme sacrifice for King and Country. Events have included church tower Open Days with Armistice 2018 information displays and special ringing performances. Twelve bell ringers from the Winchester area who died in the Great War were a significant loss to the community; organised to commemorate those men, eight ringers of today, from the same church towers as those who had died, rang 1918 "changes" at St John the Baptist Church, New Alresford recently. Royal Flying Corps, Royal Navy, British Army, Royal Marines and Merchant Navy. "Ringing Remembers" is the nation's bell ringers' campaign to mark the WW1 Armistice Centenary and is officially endorsed and sponsored by HM Government. Churches and ringers right across our Winchester and Portsmouth Bell Ringer's Guild region will be participating and doing their utmost to have tower bells ringing out, loud and clear, for all to hear. "Ringing Remembers" across the bell ringing world has focused on recruiting 1,400 new bell ringers, to symbolically replace and honour the 1,400 known to have died in the WW1 conflict. 2,000 new recruits have registered, the majority in the U.K., and many will be making their personal Act of Remembrance by ringing bells on Armistice Day 2018.